Our little berries aren't quite berries any more, or at least they are the biggest berries I've ever seen! 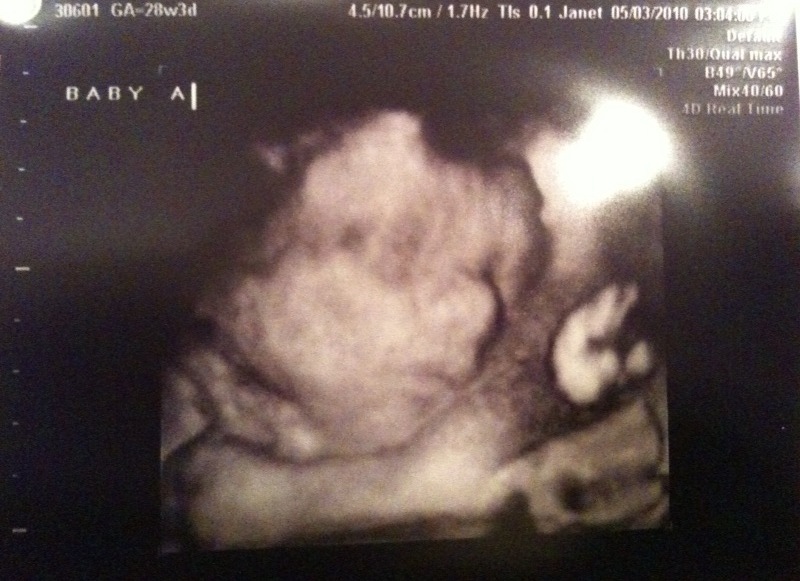 Baby A measured at about 2 lbs 14 oz with a heart beat of 143 (puts her in the 53 percentile) and Baby B measured at about 2 lbs 10 oz with a heart beat of 136 (puts her in the 36th percentile - that's up from 28th percentile). They both have plenty of fluid in their sacs and seem to be quite happy. Man are they wiggly too, despite their cramped quarters :-D It's definitely harder to get good pictures of them since they don't have as much room, but we managed to capture a few pictures. The Dr. said he was very pleased with their development, especially since their size discrepancy had gone down from 9% to 8%, which he said is fantastic (anything below 15% for twins he said was good). So after the Dr. said how pleased he was with the girls he moved on to a different subject. Something I noticed during the sonogram, but didn't quite realize how much had changed. Apparently my cervix has shortened to a point where he wants me to come back in a week for him to check it. If the rate that it is shortening continues he will put me on bed rest starting next week - boo! So at this point, bed rest isn't necessarily a matter of if - it's more a matter of when (and where since he wouldn't speculate whether or not it would be home or hospital bed rest). I guess it all depends on how I measure next week. For now my activities have been limited, so no more walking, weights, yoga, or swimming for me. I can go to work, but I need to keep my feet propped up and when I'm at home I need to spend the majority of my time laying down on my side. In the meantime I am talking to HR at work and trying to get things set up for my absence (which is a little earlier than I was anticipating). I don't know at this point if I will be able to work from home or not, they said they would tackle that hurdle when we get there. So that's what's new with us. 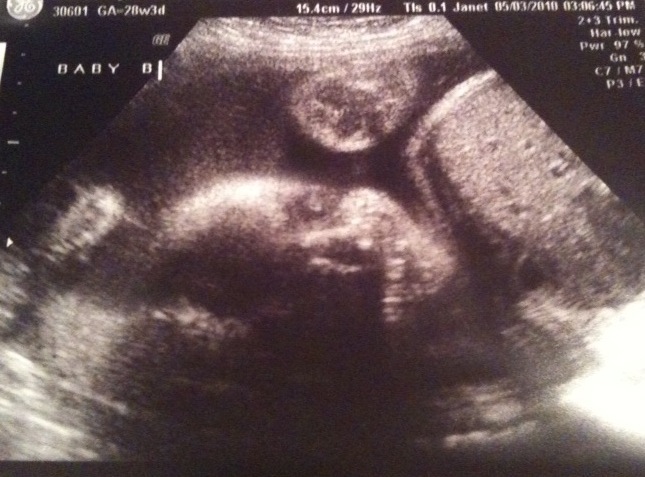 As surprising as this development is, ultimately we're just happy to have two happy and healthy little girls. We'll do whatever we can to keep them that way. I may just get to spend more time knitting soon. As far as our date is concerned, we talked to the doctor about July 7th and he said we shouldn't have any issues making that work :-D Hopefully we can keep the little girls in for that long. I'm feeling pretty positive about it. I just need to relax for three now and enjoy my little wiggle worms while I get to have them close.